Las Cruces, New Mexico is threatening to cut off water, gas and sewer service over unpaid red light and speed camera tickets. With more and more vehicle owners simply deciding refuse to pay red light camera and speed camera tickets, private, for-profit companies and municipalities are growing increasingly desperate. America’s second-largest city shut down its photo ticketing program last year largely because residents who could not afford the $500 citations did not pay them. On Monday, Las Cruces, New Mexico announced it would shut off the utilities of city residents who refused to pay Redflex Traffic Systems, the Australian company that owns and operates the cameras. Las Cruces claims vehicle owners owe $2 million. To encourage payment of the $100 photo fines, the city says it will employ an ordinance the council adopted in 1988 giving itself the right to shut off utility service to residents declared delinquent for any reason. “The city may decline, fail or cease to furnish utility service to any person who may be in debt to the city for any reason, except ad valorem taxes and special assessments,” city code Section 28-10 states. The city provides gas, water, sewer and trash services. Ordinarily, the New Mexico Public Regulation Commission prevents shutting off the utilities of low-income residents from November 15 to March 15. This is primarily a safety issue as lack of heating during a cold snap — Las Cruces recorded a -10 degree temperature in 1962 — could endanger the elderly. The commission also protects the seriously ill and customers on Medicaid or on assistance from a charitable organization. A spokesman for the commission, however, told TheNewspaper that no such protections apply to utilities run by a municipality. 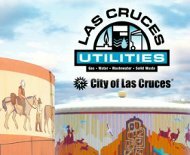 To have service restored, Las Cruces and its private vendor will charge a $48 re-connection fee on top of $125 per ticket. Las Cruces gave Redflex approval to issue speeding and red light tickets three years ago. In January, a local university was unable to prove the program delivered a substantial safety benefit. Last year, a majority of voters in Albuquerque voted for the removal of red light cameras.